African acrobats and dancers for hire. The Bantu African Acrobatic Group is a UK based group promoting traditional African performing arts through dance and acrobatics. The group also offer workshops in drumming, tribal dance, modern soukous, gumboot dance, fire dance, mwanzele and ibirandi (funeral and wedding celebration dances), Maasai dance, Limbo, acrobatics and hoop diving. One of the best groups around promoting traditional tribal dance, Limbo, fire eating, African acrobatics and various dance forms including Maasai and modern soukous in the style of ‘Ndombolo’. Soukous, another name for African rumba, is a genre of music that emerged in the Congo in the 1930s and 1940s. The name is derived from the French word secouer, meaning to shake. In the mid 1990s soukous evolved a new style called `Ndombolo’ – interspersing shouts with bursts of vocal melody and harmony over fast and powerful drumming. 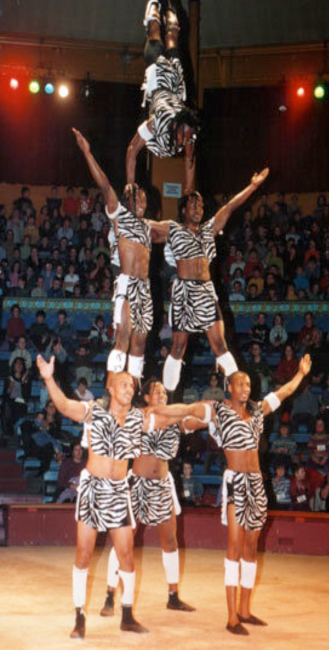 The Bantu African Acrobatic Group was formed in Kenya in 1990 and began performing at high profile events and festivals in East Africa, later travelling through numerous African countries entertaining audiences in hotels, on cruise ships, at clubs, colleges, schools and at national celebrations. Further afield in Europe they enjoyed a successful tour which included numerous appearances on radio and television. This culminated in them winning the Best Act award at a Grand European Final in Ireland for their authentic, energised performance and colourful African costumes. Outside Europe they have appeared in the Gulf States, Thailand, Japan and America. They offer workshops in drumming, tribal dance, modern soukous, gumboot dance, fire dance, mwanzele and ibirandi (funeral and wedding celebration dances), Maasai dance, Limbo, acrobatics and hoop diving.